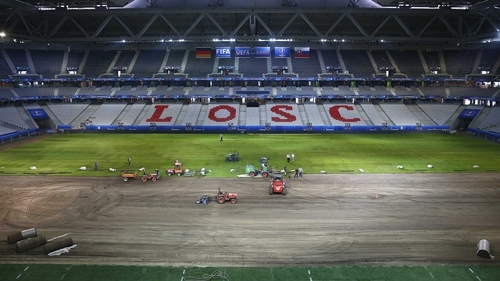 French ground staff are rapidly trying to relay the controversial pitch at Lille's Pierre Mauroy stadium with Dutch turf in time for Germany's last-16 clash with Slovakia at Euro 2016 on Sunday. Some of the pitches at the tournament have been criticised by players and fans alike. The Lille surface, which suffered torrential rain before its first game between Germany and Ukraine, has been singled out as being particularly bad. Workers are putting in long hours at the ground to replace the turf with grass grown in the Netherlands. "The extremely difficult weather conditions in the past few weeks (rain, humidity, lack of sunshine) have caused irreversible damage to the surface at the stadium, in spite of a series of measures put in place to allow the playing surface to recover," UEFA said in a statement. Two games at the stadium have been played with the roof closed to protect it from rain, and neither Ireland nor Italy were allowed to train on the pitch the day before their group game on Wednesday to give it maximum time to recover. Since then rolls of turf have been carefully laid out and packed down before staff with buzzing petrol lawnmowers gave it a meticulous going-over with huge fans for air circulation lined up on one side of the pitch. With players losing their footing regularly during some Euro 2016 games and the efforts of ground staff armed with pitchforks at half time proving ineffective, UEFA has blamed bad weather for the problems. Apart from replacing the Lille pitch, the governing body also said that it will also act to improve the surfaces in Marseille and Saint Denis in Paris following complaints. Despite the time constraints, pitch specialist Chris Hague says that it is possible to make significant improvements to poor playing surfaces in time for the knockout games. "Everything is fixable. There is always a solution," said Hague from Turf Grass Productions, a company based in Denmark which specialises in grass-based sporting surfaces. "There are four factors that influence the quality of the pitch. We call them WALT - water, air, light and temperature. If you get the four of them right and have a bit of common sense, you'll have a good pitch," he said.